Big Blue Villa is a brand new property situated in the picturesque village of Katsarata. 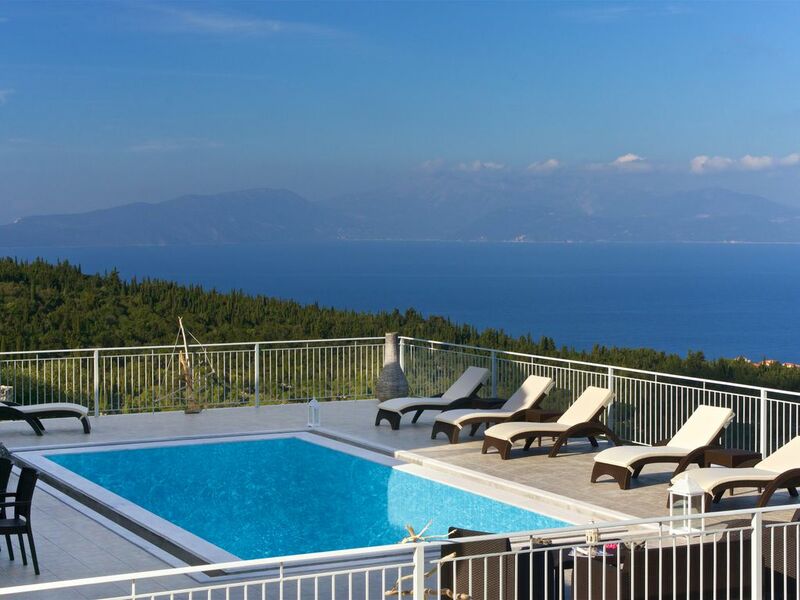 The location is private and secluded but only a short drive from Fiskardo. The villa enjoys a privileged uphill position with extensive and breathtaking sea views over the Ionian Sea, Ithaca and Lefkada. The villa covers 130 m2 and is based on two levels. The main level comprises of an open plan living room/ kitchen, two bedrooms and 2 bathrooms (one en suite) all of which have direct access to the large terrace (190m2) and the pool. The third (Master) bedroom is on the second floor. It has en suite bathroom and a private balcony that commands uninterrupted views over the Ionian Sea. The villa is finished to the highest standard, all comforts are available and offers panoramic views. It is a beautiful place to stay, very clean, well stocked, private and quiet! Would have like to have the deck chair cushions to make it more comfortable to sit on! We absolutely loved our stay in Big Blue villa. It was the perfect location to reach all the beaches and restaurants in the area. The villa was very well equipped and had amazing views. We would come back here tomorrow we loved it so much! Thank you! We enjoyed 2 weeks at Villa Big Blue, we could not of asked for anything better. Only comment we have is that there are 6 sun beds, but only 1 umbrella, so really needs at least 1 or 2 more. As a family of four adults, we spent a wonderful week at this beautiful villa. The villa itself is perfect - well stocked with everything you will need, high quality finish and has breath-taking views. It's exactly like the pictures! The village of Katsarata is quiet and peaceful, but only a short drive into the nearest village which has a few supermarkets and restaurants. The picturesque village of Fiscardo is a little further - approx. 8 min drive away. In any case, a car is essential. Do not hesitate to book this villa - we spent a wonderful week here and just wished it had been longer! We just come back from 1 weeks holiday in the villa. With two young kids and stressfull jobs in London we were looking for a quite mediterenian escape and we found nothing less. The villa was in agreat location a short drive from the beach; which was not always needed as the pool within the villa was great. The villa itself was spotless and very roomy. The views were great and you could combine quite time in the villa with more cosmopolitan time in the nearby restaurants and bars. The family loved it and we will make sure we come back. it was a unique experience staying in that house. the property has everything that you need in order to have a pleasant and luxury vacation. the view was 360! the house was cleaning twice a week from a professional company! all the famous restaurants and night life was just 4 minutes away by Car! honestly a unique summer vacation!!! Nearest beach is Emblissi: just less than 3 kilometer. Foki beach: approx 2 kilometers. Myrtos beach: approx 20 kilometers. Assos fishing harbour: 18 kilometers. Car hire is essential. The airport at Argostoli is 50km away which is a drive of approx. 1 hour 15 mins although a new road is just being completed which will take about 20 mins off this time. Fiscardo is approx 5km by road with it's excellent variety of high class bars, restaurants and shops. The nearest supermarket and tavernas are at Maganos, approximately 1.50km away. Other Activities: Sailing, diving (PADI club), motor boat for rent.